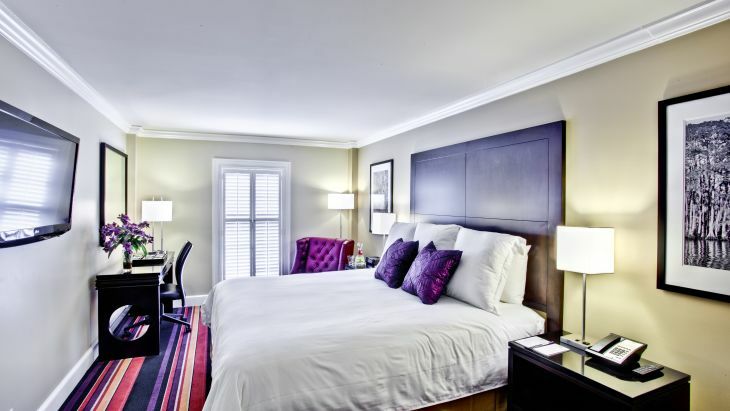 Cozy and chic, these rooms are nestled on the lower levels of the hotel and provide a serene oasis from the debauchery of Bourbon Street just outside. These limited-view rooms are perfect for the traveler who likes to keep the plantation shutters closed and retreat into a place of calm every night. Stretch out onto your plush pillow-top bed, sink into the cushy red leather reading chair, slip on the cotton waffle bathrobe. Other features include a 42-inch flat panel TV, iHome clock radio, coffee maker, desk with ergonomic chair, granite countertops and luxe bath amenities.